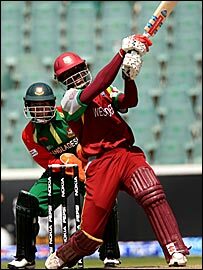 West Indies crashed out of the ICC World Twenty20 after losing by six wickets to an inspired Bangladesh. The Windies lost Chris Gayle, who hit 117 from 57 balls in the defeat by South Africa, for a third-ball duck. Marlon Samuels' two sixes and two fours in an over and Dwayne Smith's 29 from only seven balls took them to 164-8. But Mohammad Ashraful made the fastest Twenty20 international fifty, 67 off 27 balls, adding 109 with Aftab Ahmed (62) as the Tigers won with 12 balls left. The damp pitch, particularly frustrating for the small crowd given the perfect sunny conditions was caused by over-watering from the groundstaff. It was followed by a damp squib of an innings from master blaster Gayle. The enigmatic Jamaican chose to offer no stroke to the opening two deliveries before cutting the third straight to point. It brought reward for left-arm seamer Syed Rasel, who produced the outstanding figures of 1-10 from his four overs and was denied by a single of becoming the first player to bowl successive maidens in Twenty20 internationals. Tigers skipper Mohammad Ashraful then made the unusual decision to give the second over to slow left-arm spinner Abdur Razzak, but he was slog swept for six by Chanderpaul and swiftly taken out of the attack. His replacement, Mashrafe Mortaza, fared no better, however, beginning with three wides and being smashed for two fours by Smith in his second over. Chanderpaul defied his cautious reputation with one majestic stroke, moving across his stumps to flick from outside off stump over mid-wicket for six. Samuels suffered an injury getting off the mark, necessitating Chanderpaul's swift return as a runner. It didn't restrict him, he launched two sixes - one over mid-wicket measured at 88 metres - and two fours in over in an eventful 17th over before driving the final ball of it to extra cover. Smith then took 24 from an Ashraful over and was able to smear another many rows back at mid-wicket to take his team to a useful total. Tamim Iqbal and Mohammed Nazimuddin adopted an unnecessarily unorthodox approach to the reply from the outset backing away in pre-determined fashion. Ashraful gave the innings some momentum, however, with three successive fours off paceman Daren Powell. His improvisation was more considered, waiting for a delivery on leg stump to crouch and flick over fine-leg for six, which he followed by thumping a conventional off drive. When 29 Ashraful was reprieved when he top-edged Ravi Rampaul, but having got in a good position at fine-leg Fidel Edwards spilled the chance as he slipped to the turf. The out-cricket continued to be a problem, wides errant throws and overthrows resulting as the Windies buckled under the pressure of the brilliant partnership. Ashraful nonchalantly flicked a free hit off the erratic Edwards over fine-leg for six to record his fifty from 20 balls. He departed when driving a Ramnaresh Sarwan full toss to extra cover, leaving 28 needed from 34 balls, but the assured Ahmed remained for a memorable win. Bangladesh captain Mohammad Ashraful: "I knew in my mind that 50% of the match had been won by winning the toss, but we still had to go out there and get the runs. "The boys have trained hard over the past month. We even attended an army commando camp and I was confident we would do well in Twenty20."